Use this link to access the BCR Mission Tracker to log your volunteer time. If you have forgotten your user name or password contact BCR. Once you are logged in the tracking system, select “Volunteer Tools”. 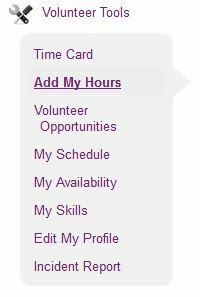 Then select “Add My Hours” from the menu on the left. Enter the date you volunteered, start time, and number of hours. From the “Department” menu scroll down to find “Hobbs Observatory” and select one of the categories. BCR Astronomy Groups – includes BCR group programs (including prep time) and/or observing sessions. Citizen Science: Comet Tracking – includes activities tracking near earth objects. Citizen Science: Radio Astronomy – includes activities for radio astronomy. Hobbs Astronomy Outreach – includes monthly programs (including prep time), Saturday observing and special events (if not recorded elsewhere). Miscellaneous Observatory – includes observatory maintenance, cleaning, or other activity not listed above. Northwoods Starfest – includes all Northwoods Starfest activities. Offsite Astronomy Outreach – includes astronomy related activities not at the BCR campus that promotes visiting Hobbs.